I am back after a 2-week super holiday in Morocco. I cannot begin to tell you how welcome this break was. And what is better than a sunny break at the end of winter? Of course, I have not been making anything while I was away. I have not bought any fabrics either. You would think you can find fabulous fabrics in Marrakech but actually ... not really. At least, not dress-making ones. Or not to my taste. I would like to share one of my recent & favorite projects. 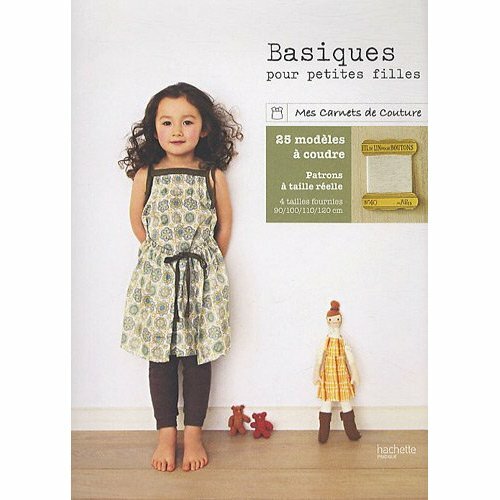 It is "robe à encolure carrée" from the Japanese sewing book "Basiques pour petites filles" de Yuki Araki. I love this book's simple but yet sophisticated designs. I strongly recommend it, even for the beginner seamstress. There are quite a few easy projects. Actually, I have only tried the easy ones! The Robe à encolure carrée" is one of those. I made it in size 100, which should suit a 3 year old. It is a little big for my girl but it still looks nice! I really like the line of this dress. It is simple, yet very flattering. I actually like it so much that I plan to do it over and over again! The fabrics come from one of the shops in Shepherd's Bush in London. I chose a black satinated cotton, which it really soft - and a contrasting brown dotty cotton.